This was my first time making this. 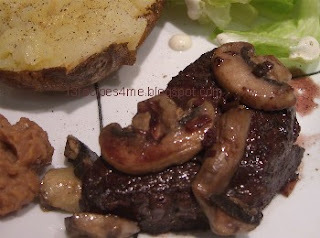 I am not a huge steak fan, so this was very much an experiment, but my family loved it. Sprinkle each fillet with garlic salt and pepper. Cook in 1 TBS olive oil in large skillet over medium heat until medium-rare, about 4 minutes per side. Remove to plate and place in warm oven to keep from getting cold. Add garlic, onion, and wine mix to browned bits in pan. Stir and heat 2-3 minutes. Spoon glaze over meat and serve.